So a couple of days ago when I needed a color picker for Streetsoccer, I found myself in the situation of having to write one myself and I thought I spare everyone the trouble of going through the process by writing this post. 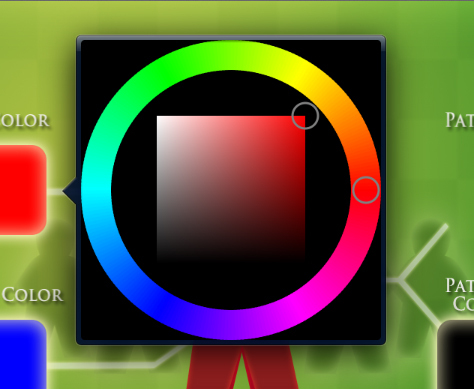 What we are about to set off to is a journey on how to create a basic hue/saturation/brightness circular color picker like in the screenshot above. Note that the black background and the shape do not belong to the control itself but to a UIPopoverController that simply hosts the ColorPicker. The screenshot is taken from the custom jersey configuration in StreetSoccer. The first part I started with is the hue circle. The easy way to do this would be to generate it in Photoshop and then bake it into an image. However, I wanted the control to work on various resolutions so Core Graphics was the obvious candidate. Unfortunately, Core Graphics can only draw linear gradients and so some folks over at StackOverflow proposed the solution I’m also using: Drawing a number of circle segments, each with a flat color. If the number of segments is high enough, it looks like a smooth gradient. The code draws sort of a skewed rectangular shape and rotates it around the center of the control. When the number of subdivisions is small, we don’t have a circle but some n-gon shape. As some commentator noted, when the number of subdivision isn’t quite high, gaps between the segments are noticeable. The reason for this is that the calculation of the segment vertex positions is done using the circle perimeter (for an x-offset) and the radius (for a y-offset), neglecting the fact that such a point will not lie on the circle itself! It simply does not follow the curvature of the circle. This was easily solved by using the proper trigonometric functions. It’s a lot of stuff to draw. Okay, the last point requires some more explanation. My initial design of the control used a class derived from UIView that did all the drawing by overwriting UIView::drawRect. However, when the user starts modifying the hue/saturation/brightness values, I had to draw the whole control over and over again and drawing all those segments slowed down the UI considerably. So I scrapped that idea and instead of overwriting UIView::drawRect, I implemented three custom Core Animation Layers, one for each element in the control. The hue circle for example only has to be redrawn when the control size changes, not when the user changes the color values. A Core Animation Layer nicely caches the rasterized image of the circle and saves us from many drawing all those individual segments again. This by the way works even more efficient than manually drawing the circle into a UIImage and then drawing that image in UIView::drawRect. Use a layer with an OpenGL ES 2.0 context and draw a rectangle with a custom shader. This is very efficient since the shader is very simple and it uses the GPU, so frequent updates should not be a problem. I therefore took the OpenGL ES 2.0 shader example from the iOS documentation, searched for HSV to RGB conversion code and hooked it all together. //  Created by Alex Klein on 6/21/13. //  Copyright (c) 2013 Athenstean.com. All rights reserved. // color gradient circle and saturation/brightness in a box inside the circle. // using an OpenGL ES 2.0 layer with a pixel shader. // The color represented by the control. // of discrete values (e.g. allow the user to pick only from 6 values). // This defines the thickness of the hue circle. // This defines the size of the saturation/brightness box. // but with a few bug fixes and changes. // Check if the touch started inside the circle.